High quality legal documents don't have to come with a high price. at a fraction of the price an attorney would charge. A Deed is a written contract that transfers the title to property, usually real estate, from one party to another. A Deed may include warranties or simply be a transfer of all the rights the grantor possesses. The end of a marriage is difficult, but with proper and straightforward divorce forms and separation agreements many future problems can be avoided. Nothing is more important than the health of your family. From Advanced Health Care Directives to Medical Powers of Attorney, using appropriate and trustworthy legal forms is essential in ensuring your family's medical needs are met. Forms for use by landlords, property mangers and their tenants including Rental Applications, Lease Agreements and Rental Notices. Promissory Notes are written contracts whereby one party loans money for repayment at a future date. Promissory Notes vary greatly based on interest requirements, repayment schedules and security demands. Real Estate transaction are often the largest and longest-lasting an individual or business may enter. These Real Estate forms include all those you will need for the sale, purchase or management of your real properties. When selling an automobile or any type of vehicle (truck, van, motorcycle, or trailer), an Automobile Bill of Sale is necessary to document the terms and conditions of the transaction and to protect your rights. A General Affidavit is a written sworn statement about certain facts. The Affidavit allows the person that is making the sworn declaration (known as the Declarant) to make certain statements in written form under oath. A General Power of Attorney document authorizes an individual (Agent or attorney-in-fact) to act on another's (Grantor or Principal) behalf in legal, financial, and business matters. A Living Will is a written legal document that allows the creator to instruct what medical and life-prolonging treatments can be administered to him or her in event of incapacity or illness. Designed for couples with or without children. Promissory Note (Installment) form which allows the borrower to repay the loan in equal monthly installments. This promissory note sets out the amount of interest, monthly payment and time period in which the note must be paid in full. Quitclaim Deed forms are legal documents used by a person or entity (called Grantor) to transfer an interest in a piece of real property to another party or entity (called the Grantee). An Affidavit of Execution sets forth that the individual executing the affidavit personally witnessed the signing of another document. An affidavit sets forth the names of the individuals who signed the document, that they were over the age of eighteen when the document was signed and that affiant was the subscribing witness to the original document. Bulk Transfer Affidavit is for use by a business seller and informs the buyer about all creditors of the business. This affidavit contains the amount of all creditor claims and complies with UCC requirements. Name Affidavits for use when a person must declare under oath that they are the same person but known by another name. This affidavit can easily be tailored to fit your needs and must be signed in front of a notary public. Real Estate Affidavits which are specifically designed for use when buying or selling real estate. These forms include affidavits which declare certain facts about property title and appraisals. Affidavit Forms Combo Package which includes the most frequently used affidavits. Included are affidavits which relate to real estate transactions, bulk transfer affidavit for use when purchasing goods and a general affidavit for use in numerous situations. General Declaration form for use by an individual in order to declare that certain facts are true. Declarations are similar to affidavits in that they are taken under oath and are sometimes notarized. Name Declaration which allows a person to declare under penalty of perjury, or under oath, that he/she is the same person as the other names listed in the affidavit. This declaration is often used in legal matters. Automobile Bill of Sale form for use when selling an auto. This form contains all relevant information about the vehicle (including make, model and VIN), the price paid by the buyer and an Odometer Disclosure Statement. Boat, Vessel and Watercraft Bill of Sale for use when selling or buying boats, vessels and other types of watercraft. This form includes a description of the vessel, warranty information and transfer of ownership language. Cat Bill of Sale for use when selling or purchasing a cat. This bill of sale contains a short description of the feline, warranty against illness information, price paid and transfer of ownership language. Dog Bill of Sale specifically designed to document the sale of a dog. This form contains a detailed description of the animal, whether registered, information about illness and price paid for the dog. It also contains language regarding transfer of ownership. This Electronics Bill of Sale is between a seller and purchaser of any type of electronic device (such as a computer, laptop, iPad or television). This bill of sale sets out the names of the parties and the purchase price. It also sets out device specifics such as name, brand, model number and any features. General Bill of Sale for use when buying or selling any type of personal property. This form sets forth a description of the item, its selling price and if the property is sold with any warranties. Mobile Home Bill of Sale form is for use when selling or purchasing a mobile home from an individual. This form contains all relevant information including the mobile home's location, make, model, size and year and any warranties which remain on the mobile home. Motorcycle AS IS Bill of Sale for use when selling a motorcycle with no express or implied warranties. This form sets out a detailed description of the motorcycle, price paid and an Odometer Disclosure Statement. Motorcycle Bill of Sale for use when selling or purchasing a motorcycle. This form sets out a detailed description of the motorcycle (including make, model and VIN), price paid and also contains a Odometer Disclosure Statement. Contract for Deed form to be used when selling real estate. This contract is between a property owner and a buyer who agrees to make installment payments. Under this contract, the seller retains legal title to the property until the buyer has paid the full purchase price. A Grant Deed is the most commonly used kind of deed in California. It is used by the owner of the property (known as the Grantor) to grant all interest and rights held in the property to another person (known as the Grantee). One of the most common types of documents used to transfer an interest in property is a General Warranty Deed. This type of deed provides the greatest protection of all types of deeds because it includes guarantees from the seller (known as the Grantor) to the buyer (known as the Grantee) regarding the title and the seller has the right to sell the property. Special Warranty Deed which conveys interest in real estate without warranties against defects in the title. This type of deed affords greater protection to the buyer than a quitclaim deed and contains a complete legal description of the property being conveyed. Deed Forms Combo Packages specifically designed to provide Deeds for use in a variety of situations. Cohabitation Agreement for use by a couple who decide to move in together with no immediate plans for marriage. This agreement sets out the couple's arrangement in regard to payment of household bills, if earnings will be considered as separate property and division of personal possessions. Divorce Appearance, Consent and Waiver for use when one spouse joins the other in an effort to obtain a divorce. This document enters an appearance, consents to the court's jurisdiction and waives specific rights. Final Judgment and Decree of Divorce which orders the dissolution of a parties marriage. This document is a legally binding court order that declares that the marriage between the parties is dissolved and that the parties are restored to single status. Financial Statement Kits for use by spouses who are divorcing. This kit contains numerous questions regarding each spouse's finances and will be useful in deciding income and property issues related to the divorce. A Pet Custody Agreement will effectively set out who receives custody of any pets if a couple decides to end their relationship. Advance Health Care Directive which allows you to identify the care you want to receive in the event you are incapacitated or unable to express your wishes. This Directive also contains a Living Will and Power of Attorney which will allow you to appoint a specific individual to act as your representative and make decisions regarding your health and well-being. This kit provides tools and guidelines to assist you in creating your Anatomical Gift and is designed to fulfill the obligations of the Uniform Anatomical Gift Act. This Authorization to Disclose Health Information allows you the flexibility to determine what types of information can be released and under what circumstances. This form also complies with HIPAA (Health Insurance Portability and Accountability Act) Privacy Rules. Power of Attorney for Health Care which allows you to appoint another person to make health care decisions on your behalf. This form sets out the name of the person who is so empowered and the specific powers granted to that individual in regard to your health. Estate Planning Combo Packages are specifically designed to provide you with an array of estate planning documents. Estate planning forms contained within the packages are Wills, Powers of Attorney, Advance Health Care Directives and Organ Donation forms for use in variety of situations and for individuals with or without children. Health Care Combo Package which contains the forms most frequently used in health care matters. Included are forms related to organ donation, living will, health care power of attorney and an agreement which will revoke an existing health care power of attorney. Powers of Attorney Combo Package containing forms related to health care matters. Included are Durable Powers of Attorney (Effective Immediately and Upon Disability), General Power of Attorney and one for Care of Children and a Notice and Revocation of General Power of Attorney. When a Tenant has failed to act in accordance with a responsibility under the lease or a term of the lease (e.g. rent payment not made, failed to obtain permission prior to making alterations, etc. ), the Landlord can use this legal form sometimes referred to a "Notice to Quit" or "Eviction Notice" to provide written notice. Residential Lease Agreement with Option to Purchase is for use by a landlord when renting property and offers tenant the option to purchase the property for a pre-determined price. This agreement sets forth all relevant provisions including the price in order to purchase the property. Residential Rental Application which will ensure that a landlord has all relevant information about a prospective tenant before renting to them. This application requests information about the applicant and his/her spouse, prior rental history and credit, bank and personal references. Residential property lease agreements including month-to-month leases, room leases, leases with options and more. Lease Amendment which will effectively amend an existing lease agreement. This form sets forth the exact provisions to be amended and those which will remain in effect. These agreements will effectively extend a lease and sets forth all provisions surrounding the lease extension and any lease terms that will remain the same. Lease extensions are often used in lieu of signing a new lease. Mobile Home Leases and Agreements for use by an owner or landlord when leasing a mobile home. This lease agreement sets out detailed provisions including the lease term, amount of monthly rent and tenant's quiet enjoyment of the premises. This Move-In and Move-Out Inspection Checklist will clearly document the condition of a rental property before tenants move in and when they vacate the premises. Advance Health Care Directive which allows you to identify the care you want to receive in the event you are incapacitated or unable to express your wishes. Power of Attorney for Care of Children is used when appointing another individual to act as your agent for the care of your children. The Power of Attorney for Children sets out the specific decisions your agent may make regarding the child, including those related to health and medical care, living arrangements and education. Sometimes it is necessary for a person (called the Grantor or Principal) to grant another person the power to act on his or her behalf. 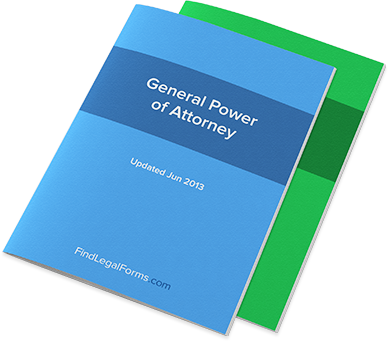 A Power of Attorney is the legal document used to grant this type of power. Durable Power of Attorney which becomes effective upon the principal's disability or incapacity. This document bestows certain powers (such as entering into legal documents, manage rental properties or bank accounts) to the individual named in the form. Limited Power of Attorney (With do it yourself Options) contains various options so the form can be tailored for your specific needs. This form allows you to designate an agent who will act on your behalf, powers given to that agent and if the document is effective immediately or upon disability. A Power of Attorney for Health Care allows you, the grantor, to designate a trusted individual, the agent, to make necessary health care decisions on your behalf. This legal document sets forth the specific powers granted to the agent including the powers to refuse or consent to certain forms of medical treatment. Real Estate (Sale) Power of Attorney is for use when you need a limited Power of Attorney for real estate sale transactions. This document allows you to appoint another person as your agent in order to sell real estate on your behalf but grants only those powers. A Limited Power of Attorney allows a natural mentally competent person (called the Principal or Grantor) to authorize someone else (called the Agent or Attorney-In-Fact) to act on his or her behalf. Installment Promissory Note with Final Balloon Payment. This promissory note requires equal monthly payments but differs because it includes a large final payment which will include all remaining principal and interest due on the promissory note. Promissory Note - On Demand which allows the note holder to demand payment at any time. This note sets out the original amount of the loan, its term and that the note can be repaid at any time without incurring a prepayment penalty. Promissory Note--Term which requires that principal and any remaining interest on a promissory note be paid on a certain date. This form sets out the principal amount, repayment schedule, interest rate and remedies in the event of default. Vehicle Bill of Sale with Promissory Note is used when selling a vehicle to a buyer who will make monthly payments under a promissory note. Promissory Note - Secured (Installment) for use when making a loan secured by property and paid in monthly installments. Carefully drafted by our attorneys, this note will set out the terms of this type of installment arrangement, including the type of security. This Promissory Note - Secured (On Demand) packet gives you all the tools and model forms you will need to tailor a promissory note allowing for a loan to be secured by collateral or property. This Promissory Note - Secured (Term) packet gives you all the tools and model forms you will need to tailor a promissory note allowing for a loan to be secured by collateral or property. This attorney-prepared Release of Promissory Note Kit is specifically designed for a release that is based on something other than payment in full of the underlying note. Specifically designed to be used during real estate transactions, providing you with the forms and instructions you will need to protect yourself. Offers to Purchase Real Estate for use by a prospective buyer to offer to pay a certain price to a seller for real estate. This offer contains the conditions of the offer, including financing conditions and when the offer will expire. Lease Form Combo Packages which are specifically designed to provide you with an array of residential and commercial lease-related documents. These combos contain applications, agreements, leases, subleases, security deposit forms and other frequently used forms. Disclosure statements for use when buying or selling real estate. This Kit ensures compliance not only with federal requirements to disclose information regarding lead in a home, but often more stringent state requirements for disclosures. Real Estate Purchase and Sale Combo Packages which contain frequently used real estate sale and purchase documents. This combo contains real estate contracts for land and cash or seller financing, a residential sales contract and an offer to purchase real estate. Real estate transaction related releases and declarations. Forms which set forth explanations and valuable information to assist you in naming an executor and any beneficiaries of your estate. The methods and manners of distribution of your property upon your death using a will are discussed in this kit. Your assets consist of different types of property. It may be personal property, real estate, community property, stocks, bonds, cash, heirlooms, or keepsakes. Wills for Married Persons with no children, adult children or minor children for whom a guardian must be named. Statutory Wills specifically designed for use in the states of California, Maine and Michigan. These statutory forms are simple to use and will allow you to easily set out how your estate will be distributed. Wills for Widows and Widowers with or without children. Protecting your company's trade-secrets is essential for future success. Confidentialty and Non-disclosure forms are an important first step in securing your proprietary assets and establishing a strong deterrent for theft. Corporations are a business entity that allows its owners, officers and employees to be shielded from certain types of liability and personal financial obligation. Additional benefits include tax reduction and ease in raising investment. Whether it be copyright registration, patent protection, trademark infringement or software licensing, protecting your business's intellectual property rights is essential for its future success. Legal documents for use in the development, maintenance and sale of websites, software and other types of technology. For use in numerous situations and will release another party from past and present claims. This release sets forth the particulars about the incident and if any compensation was paid in order to obtain the release. Independent Contractor Agreement is for use when hiring a contractor to provide specific services. This agreement sets forth the detailed terms including scope and duration of the project and that the independent contractor is not eligible for employer benefits. Long Form Confidentiality Agreement for use when confidential information (such as trade secrets or intellectual property) must be protected. This agreement prevents the recipient of confidential information from disclosing this information to other parties. Partnership Agreements are written documents that allow two or more people to form a partnership together. They address many subjects including the name of the business, terms, contributions and responsibilities, termination and much more. Helps website owners retain power and security over their site by establishing the ground rules? for users' behavior on a website. Used when hiring an individual to create a copyrighted while the employer will retain all rights in the work. Promissory Notes & Loan Agreements containing a Loan Extension Agreement with Guarantor Confirmation. This agreement effectively extends the maturity date of a loan and is between the borrower, guarantor and lender. Business Credit Application for use when checking the credit history of a business customer. This application contains information to make an informed decision, including names and addresses of all company members and credit and banking history. This Credit Agreement - Time Payment is between a business and a customer who agrees to pay for purchases before a designated date in the future (otherwise the customer will incur financing charges). This agreement sets out all relevant terms including definition of the sales price, how finance charges are incurred and minimum payments due on certain balances. Employee Confidentiality Agreement specifically designed to protect a company's business and trade secrets. This form contains provisions regarding an employees use of company secrets and confidential information. It also sets forth than the employee agrees not to remove any information from employer's premises. This Short Form Confidentiality Agreement prevents one party from disclosing confidential information, such as trade secrets, to another. This agreement is often used by employers and employees. Mutual Confidentiality Agreement to be used when more than one party agrees not to disclose information provided by the other party. This agreement sets out the specific information not to be disclosed and when the agreement will terminate. Confidentiality Agreement for Potential Investor is between a company and a potential investor who receives confidential and proprietary information about the company. This agreement specifically spells out that the information provided is for investment purposes only and the investor is prohibited from contacting company's owner or employees. Amendment to Confidentiality and Non-Disclosure Agreement for use when amending an existing agreement. This form effectively sets forth the specific provisions which will remain in effect and those which are amended. Confidential Information Release for use when authorizing another to release confidential information on your behalf. This form contains an expiration date and can be used to authorize a physician, attorney, hospital, clinic or school to release confidential information about you. Bylaws for use when setting up the structure and operation of your corporation. These Bylaws set out the number of directors and officers of the company, how they are elected, when formal meetings must be held and how any board vacancies will be filled. Dissolution of Corporation form for use when it is agreed that a corporation should be dissolved. This form can be used to voluntarily dissolve the corporation by agreement of the directors and shareholders or in the event of corporate bankruptcy. Resolutions which cover a variety of situations encountered by a company's shareholders or the board of directors. Various corporate shareholders agreements and forms including resolutions, authorizations and more. Corporate stock certificates and ballots. Forms used to create and maintain options for employees to purchase company stock. Pre-Incorporation Kit for use by those in the process of filing a corporation. This kit contains worksheets and checklists which will help in determining your corporation's purpose, type and structure. It also contains a document filing checklist to ensure your corporate paperwork is filed correctly. Employee Confidentiality Agreement specifically designed to protect a company's business and trade secrets. This form contains provisions regarding an employees use of company secrets and confidential information. Handbook which sets out a company's policies, rules and regulations regarding employee benefits, wages, bonuses and employee conduct. Employment Application which will assist an employer in screening candidates for a position. This application is specifically designed to help you obtain the necessary information in order to evaluate the applicant's qualifications and skills for the employment position. Agreements by employee to uphold certain conditions for a set period of time after leaving a companym including non-solicitation of employees and employment with a competing company. For use by employers seeking assignment of employment and pre-employment inventions. Included are an Assignment of Pre-Employment Works and agreements concerning patents and inventions which are discovered by the employee and will be assigned to the employer. For use by an employer when hiring a sales representative. This agreement sets out the specific goods or services the representative will sell, compensation and payment of expenses provisions and if the representative is considered an employee or independent contractor. Intellectual property licenses agreements covering service marks, copyrights, domain names, music, shrink-wrap, stock photo and trademarks. Notice of Assignment of Intellectual Property will act as official notice that intellectual property has been assigned and will prove invaluable in the event of misunderstandings, disagreements or litigation. Documents which allow the owner of a patent to either assign or sell the rights to a patent to another party. Royalty Agreements between a writer and a publisher wherein a publisher agrees to pay royalties for the publication and reproduction of a composition. This form sets forth how royalties are calculated and when they will be paid. Trademark Assignment Agreement is between the owner of a trademark (the "assignor") and a party to whom all rights in a trademark will be assigned (the "assignee"). This agreement sets forth the exact mark(s) to be assigned and that all rights, title and interest in the trademarks will now be the property of the assignee. Effectively demands that an individual or entity cease use of a registered trademark (and url, if applicable). This letter sets out the name of the trademark, its registration number and encloses a copy of the registration certificate. It also sets out detailed specifics of the infringement and demands that infringement immediately cease. Employee Partnership Agreements set forth the terms and conditions of admitting an employee into the partnership of a business. Confirms the discussions between a corporation (who will act as a general partner for the purposes of the transaction) and potential investor regarding a limited partnership relationship they intend to enter. A Limited Liability Partnership is a corporate entity which offers its partners a limited amount of personal liability for the debts of the partnership. This type of entity provides an alternative to a general partnership for which the partners have unlimited personal liability for corporate debts. Form for allowing two or more people to set up a partnership. Forms designed for the amendment of partnership agreements. Designed to provide you with the tools to register your Partnership Agreement. This Kit includes easy to understand instructions to ensure that you register your partnership in compliance with the Revised Uniform Partnership Act. Forms for terminating existing partnerships in compliance with governing laws. Designed to provide potential business owners the materials necessary to collect all of the basic data to use in preparing partnership paperwork. This Kit includes instructions and forms that will help assess the information needed as well as review problem areas, protecting parties from future trouble. Sale of Partnership Interest for use when one partner makes an offer to purchase another partner's interests in a business. This form sets out the type of business, purchase price and closing date of the transaction. For use in real estate transactions when a contract or lease assignment needs to be made or a lien filed. For use when buying or selling real estate including agreements regarding commissions, consent of seller for purchase and sale and more. For use by a prospective buyer to offer to pay a certain price to a seller for real estate. This offer contains the conditions of the offer, including financing conditions and when the offer will expire. Accident Claims Release which allows one party to release another individual, or company, from any future claims resulting from an accident or personal injury claim. This release form includes detailed information about the accident and any payment made in order to obtain this release. General Release (also known as a Liability Release) which can be used in a variety of situations and will effectively release a party from future liability. This General Release sets forth the incident from which this release arises and any compensation paid in consideration of the release. Indemnity Agreements for use by one party to protect against future claims or losses by another party arising out of a specific situation (such as an accident). This agreement sets out the type of situation and contains terms which binds the parties to the agreement. Mechanic's Lien Release for use in verifying there are no outstanding contractors or mechanics claims against a property. This release is especially useful if subcontractors or suppliers were involved in a construction project. Mutual Releases for use by two parties who seek to mutually release each other from all present or future liability. This document sets forth in detail the specific incident from which the mutual release arises and is legally binding on both parties. Between an artist and a gallery that will sell artist's works on a consignment basis. This agreement contains the detailed terms including the works to be shown and consigned and the option that gallery will have the exclusive right to act as artist's agent for consignment. Model agreements used by a party to transfer their rights or obligations regarding the purchase and sales of goods to another party. For use when selling or leasing equipment including certificates regarding delivery and acceptance of conditional sale or lease of equipment. Agreements regarding sales between a buyer and seller that are contingent on conditions that must be satisfied per contractual terms before the sale is complete. Designed for use when selling goods by consignment. This Kit includes provisions regarding payment, delivery, ownership of the goods before sale and more, as well the guidelines and tools you will need. Forms designed for use when puchasing many different types of iterms from a logo to a yacht and more. Receipt for the acceptance of goods. Usually used in conjunction with a delivery or purchase order. Designed for use when assigning an Internet domain name. This form includes the provisions to transfer the name including any representations made by the present owner and a detailed description of the domain name. Agreement between the owner of a domain name and a party who is granted a license to use the domain name. This form contains the necessary terms including its term, payment for the license and exact domain name being licensed. Agreement for use when selling a domain name. It is imperative that this type of business agreement be set out in writing and this attorney-prepared form contains the provisions necessary to sell your domain name. Designed for use by a website owner and his/her client to sell the client's products on the website. For use when one party is purchasing technology owned by another party. This Kit includes the guidelines you will need to tailor the agreement to your unique situation, while ensuring compliance with governing law. Sets forth the terms under which one website becomes an affiliate of another. This form contains the specific terms including representations and warranties by both parties and the amount of commission to be paid. Used to disclose how a user's personal information is collected, used, shared, distributed and protected by the website. It also contains terms about third party advertising and a security disclaimer. For use when hiring an individual to design a website. This form establishes the scope of the project, use of confidential information, time for completion and compensation paid to the designer. For use when selling or purchasing a website. Sets out the terms of the arrangement including the purchase price and how ownership of the site will be transferred.